THE award-winning Bronte spoof Withering Looks is back on tour this autumn, and its first date in our region is 25th October at Swindon. 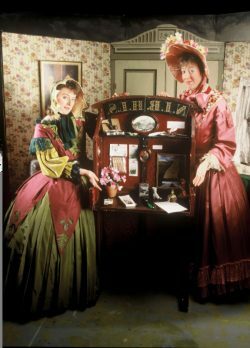 Lipservice is Maggie Fox and Sue Ryding, hailed as Britain’s favourite literary lunatics, and they just couldn’t resist the urge to dust off their crinolines, wear flattering bonnets and sit at rained-lashed windows in a pale and decorative manner. Withering Looks takes an “authentic” look at the lives and works of the Brontë sisters (well, only two of them as Anne’s just popped out for a cup of sugar.) The show is peopled with many of the characters we know and love, as Maggie and Sue move effortlessly from frock to frock coat to bring them to vibrant life. See Withering Looks at Swindon Arts Centre 25th October or at the Marine Theatre in Lyme Regis on 6th November, Poole Lighthouse on 7th, Cygnet Theatre in Exeter on 8th or Palace Theatre in Paignton on 9th November. Posted in Make 'em Laugh, The Play's the Thing on 19 October, 2018 .